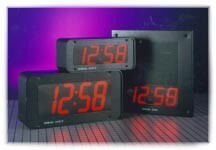 Digital clocks are available in 2.5" and 4" display sizes. Both sizes are offered in flush, surface, dual face and clock/speaker combo models. All secondary clocks are continuously synchronized with the master, so corrections are done instantaneously and all digital clocks maintain identical time. 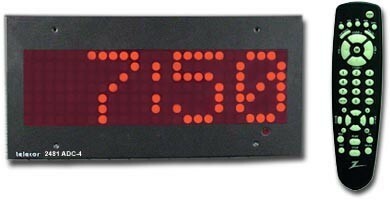 In addition to providing the time display, the clock can be directly addressed by the master, providing the ability to display alpha and numeric codes. Digital clocks are synchronized from any of the Telecor Master Clocks or from the available time base on the Telecor II and XL Communication Systems.